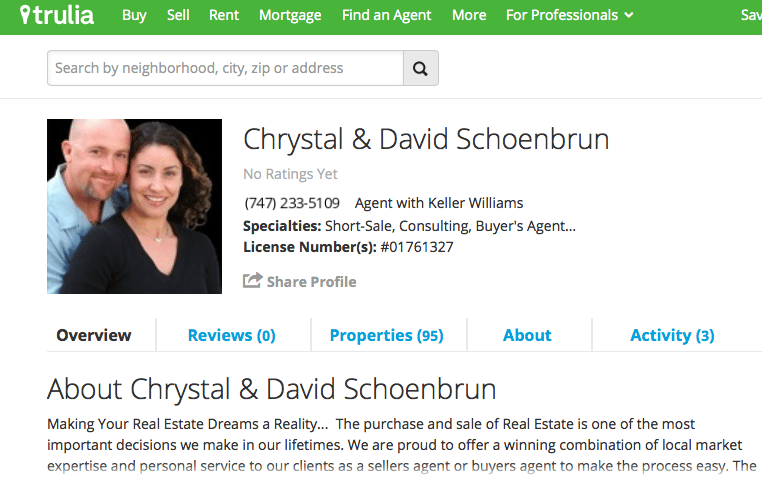 Zillow has removed many Trulia reviews in consolidating Zillow and Trulia agent profiles. The listing portal says it removed Trulia reviews because they didn’t meet its review requirements. Zillow has integrated Zillow and Trulia advertising, and profile integration should benefit agents in the long run. Carl Medford, a San Francisco Bay Area real estate agent, spent considerable time and effort over the years successfully nudging past clients to post reviews on his Trulia profile. That’s why his blood is boiling. His personal Trulia profile, which previously displayed 92 reviews, has been replaced by his agent team’s Zillow profile, which displays only 24 reviews. 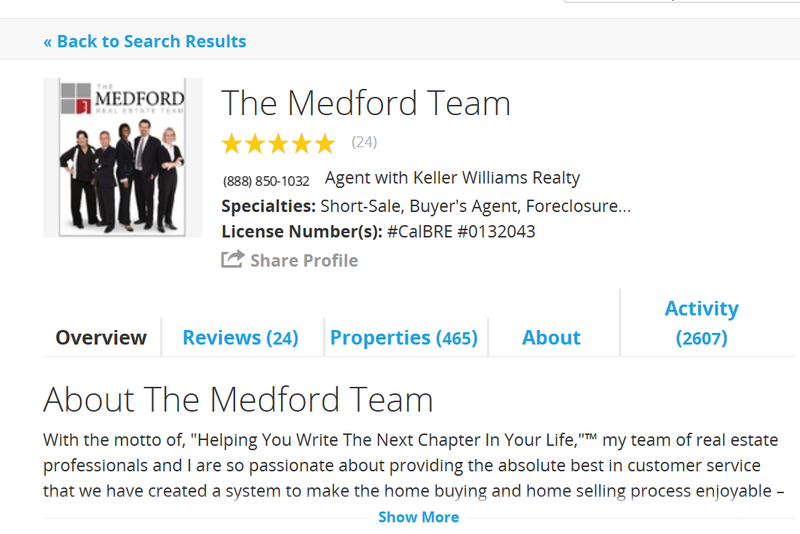 In a move that could make life easier for many agents in the long run, Zillow has inflicted some short-term pain on agents like Medford. The online real estate giant has zapped many agents’ Trulia reviews as part of a recent consolidation of Zillow and Trulia profiles, claiming that the now-defunct Trulia reviews didn’t meet its “strict review requirements.” The profile consolidation was recently executed alongside the integration of Zillow and Trulia’s advertising. Zillow told Inman it won’t restore any of the Trulia reviews that it’s removed, but that the profile consolidation is ongoing. The integration should conclude by the end of the third quarter of 2015, the listing portal said. Zillow has “manually and meticulously moderated hundreds of thousands of reviews from Trulia in accordance with the Zillow review standards” and will “not remoderate,” said Zillow spokeswoman Katie Curnutte, who declined to provide an estimate of the share of Trulia reviews that Zillow has wiped. 1) Zillow removed all reviews published on Trulia that didn’t include ratings. Trulia began collecting star ratings in 2013, but didn’t publish ratings until 2014, Curnutte said. Trulia’s formal reviews and ratings replaced Trulia’s “recommendations,” which left less room for consumers to express dissatisfaction with an agents. Some real estate agents balk at the notion that the lion’s share of their Trulia reviews aren’t worthy of publication on Zillow. The Trulia reviews that Zillow has removed were posted by real clients, those agents say. “In an era where reviews are everything, this is a massive blow to agents who have worked hard to garner unbiased reviews from clients who’ve completed successful transactions,” Medford said. “Here is my current Trulia page – I had one of the highest-ranked pages on Trulia because of my involvement over the years, but they overwrote my page with my team page from Zillow,” Carl Medford said. Zillow’s consolidation of Trulia and Zillow profiles should make cultivating an online presence on the two property search sites, both owned by Zillow Group, much easier moving forward. By combining information on both profiles, including past home sales and client reviews, the integration has created “a single, complete profile that agents only need to edit once to display updated information across both sites,” according to Zillow. But it’s also come at a cost. David Schoenbrun, a Westlake Village, California-based agent, said in the Facebook group Lab Coat Agents that his team has lost all its 23 Trulia reviews, and has only two reviews to show for itself on Zillow. “Thank goodness we copied them over to eEdge,” Schoenbrun said, referring to a software system used by Keller Williams Realty agents. He added that all his Trulia reviews had five-star ratings, meaning they weren’t the type of Trulia reviews that Zillow automatically deleted as part of the profile consolidation. While Zillow has said it won’t restore any deleted Trulia reviews, Schoenbrun claims a Trulia representative told him that it would take until the end of the week to determine if Trulia reviews meet Zillow’s guidelines, implying, Schoenbrun said, that some of his wiped Trulia reviews might be resurrected. David Schoenbrun’s profile page. It now shows zero reviews, having previously displayed 23, he said. Even reviews that have successfully transferred between Trulia and Zillow reportedly might still be displaying some faulty data. Alan May, a broker at Evanston, Illinois-based Coldwell Banker Evanston, reports that some reviews showing the correct author names on Zillow are showing incorrect author names on Trulia. “This, of course, makes all of my reviews and testimonials (if any consumer happens to look at them, side by side), look suspect,” May told Inman on Facebook. Tracy Wolchock Freeman says all 15 of her Trulia reviews have gone up in smoke. “No email or explanation,” she said. Zillow addresses its review requirements on a Q&A page about the integration of Zillow and Trulia profiles and advertising. Zillow has also automatically generated Zillow profiles for all agents with Trulia profiles who previously did not have Zillow profiles. “What if I only want a profile on one site?” reads one frequently asked question on the Q&A page. “By appearing on both Zillow and Trulia, you maximize your exposure to buyers and sellers while only maintaining a single profile,” the answer reads. While some agents may lament the loss of their Trulia reviews, others have immediately benefited from the profile consolidation. “I’m now on Trulia in a much larger way than I was earlier,” said Robert Slack, broker-owner of Ocala, Florida-based Robert Slack Fine Homes. The profile integration was announced in parallel with the expansion of Zillow’s Premier Agent advertising program across Zillow and Trulia websites and mobile apps. Slack said that inquiries generated by his Zillow advertising have skyrocketed since Zillow merged Zillow and Trulia advertising Sunday night. “Now I’m appearing in all the ZIP codes in Trulia that I was formerly in on just Zillow,” he said. “Advertisers previously using Trulia Local Ads and Trulia Mobile Ads will now be converted to Zillow Premier Agents and appear across both sites and mobile apps; agents can no longer purchase Trulia Local Ads or Trulia Mobile Ads,” Zillow said on the Q&A page. Editor’s note: This story has been updated to clarify that Trulia began collecting agent star ratings in 2013, but only started publishing those ratings in 2014. That means Zillow may have preserved some Trulia reviews that published before 2014, contrary to a statement made in a previous version of this story.